CBEX needs US Dollar and Bitcoin buyers and sellers to help build up our volume! Our goal is to return as much of the selling profit to you in bitcoin as possible. We will sell your bitcoin pro-rata with CBEX and not put our orders in front of yours. I. Profit split. When you sell your bitcoin or buy CBEX dollars to sell on the exchange through the CMFDH wallet with us we share 1/3 of our exchange fee with you. II. Hedging! 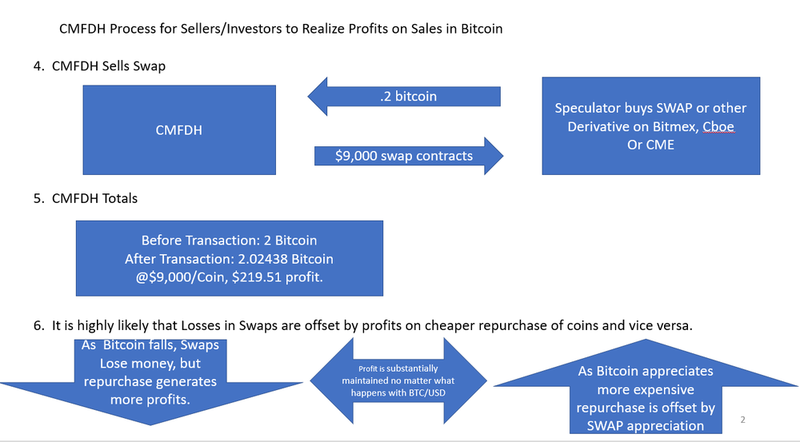 We will purchase a derivative security so that if the price moves up or down before we can repurchase the bitcoin (or dollars) we should preserve at least some of the profits from buying or selling (see the diagram below). Our goal is to redeem the profits to you in bitcoin verses dollars. It is likely we will redeem some dollars to your account in redemption requests. III. CBEX will keep tabs of your profits from selling and repurchase the bitcoin for you. a. You understand and acknowledge that the hedging is not perfect, there could be errors and there is no guarantee that it works. These derivative contracts that we use or plan to use are traded in regulated and unregulated markets and there is no guarantee that our hedging will have the desired effect. Look also at risk factors. b. You can log into CMFDH to see the value of your Bitcoin holdings at any time. We reserve the right to return to you your bitcoin in the CMFDH wallet at any time based on CBEX' capital requirements. Also, we may take up to three business days to honor redemption requests, because of security concerns and also the attempt to convert dollars to bitcoin.